After hours (minutes) searching the shelves of my local health food store, I started to worry that wheatberries were so very exotic they weren’t available up here in the Highlands. How wrong could I be? After asking the shop assistant for some assistance, I discovered this grain has been with me my whole life. It seems that wheatberry’s less adorable name is wheatgrain and it’s just wheat. Refined, most folk consume it daily in breads and cakes and beers; unrefined, it is the same stuff that I chew on whilst walking through fields. So much for exotica! I’m not complaining though. I adored this grain! Wheatberries are chewy, they’re nutty, they’re nutritious and they are ridiculously filling. I usually use the following spices in a couscous dish but found that the light, tangy flavours balanced the heaviness of the wheatgrain really well. 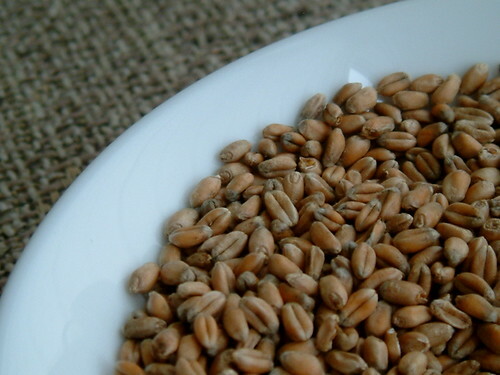 Cook the wheatberries in plenty of salted, boiling water until they plump up (anywhere between 1 and 3 hours). Heat oil gently in a pan. Add cumin, coriander, paprika and garlic. Cook gently for two minutes. Add the cooked wheatberries and all other ingredients to the spices. Combine well. I did take a picture of the above salad but appear to have deleted it. Will leave you instead with this picture of the flowers D brought me this week because I wasn’t feeling well. Don’t you think the front-left one looks like a cabbage? Well, I did and moments after being presented with the bouquet I bit a chunk out of it. It wasn’t a cabbage and didn’t taste very nice. Also, by the horrified look on D’s face, I shouldn’t expect flowers again any time soon. How lovely! I am trying to eat more grains now, too! 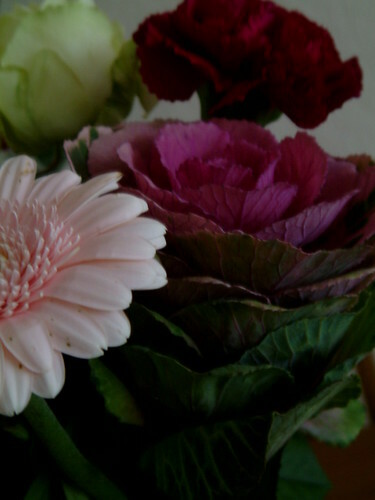 And I love the photo of the flowers! And you are right, that flower does look like a mini cabbage! My guess is that it is a cabbage – the ones you get for winter flower displays, but they’re not edible as you now know! Interesting salad, I’ve never heard of the wheatberry name. Didn’t Doris Day do a song “Please, please, don’t eat the daisies”? I’ve heard of wheatberries – it probably sells better with the cute name. I think I need to make a trip to the health food store – ao many interesting things to try! I love your pictures – I wish I could take photos like that. Wendy ~ Is there a way of finding out a standard cooking time for the wheatberries. 1-3 hours is quite a difference. Having said that, that one can have this salad at room temperature suggests that one should prepare this early, and if it’s ready, good – if not, then have it with/for the next meal! I love the addition of paprika…Is this salad by way of Hungary, or was it just an inspired addition? As to your question re: Cornish game hens, they are poussins insofar as they are young/Spring chickens. The Cornish game hen is typically cross bred in the US for eating purposes. Cornish hens are chosen because they are quite stocky in build, which is why it takes almost the same time to roast as a small adult chicken. Katie – It seems every time I go back to the health food store I find something new. Have to put it on my usual rounds, I think. Carolyn – Thank you very much. To be honest, I have to take a LOT of photos before I’m happy with one. Shaun – The only way I know is cook a test batch from the packet of wheatberries you buy. The ones I have been experimenting with only took an hour and 15 minutes to soften but I’ve been warned older grains can take much longer. Thanks for the hen info. I don’t think Cornish hens are sold across here and I kept coming across the name on blogs! I’ve had grains on the mind too, since this is starts the time of year when I make lots of warming stews. I agree with you that the name ‘wheatberry’ is unnaturally appealing; who cares if it’s something quite ordinary in the end. The salad sounds excellent. Annemarie – I’m in stew mode too. Going to try out a venison stew with chocolate and chilli soon. Sounds oddly appealling! I had the same experience with the wheatberries that you did! The little clerk at our natural food store was at a loss also. After combing the shelves for about 10 minutes looking for them, I gave up and ask the clerk. She even said “wheatberries?” I thought, oh no, now I will have to order from the internet. But she went to the store owner and he promptly come over and picked up the package of wheat grain. Never having seen wheatberries before, I kindly said, are you sure? So off to the books under the counter for a look up and yes, he was correct. I make a wheatberry blackberry chili that is delicious! I will get you the recipe. I may have done a post on it months ago. I will get back to you on that. The flowers that D bought for you are lovely! He is so sweet! Deb – That’s hillarious! I didn’t really believe the shop assistant either! you must also try farro. it is my newest my favorite grain! your shots are lovely… nice to meet you. It is a cabbage! It is a “flowering” kale; not really flowering of course, but named so because it looks like a flower. It’s bred for beauty, not food. This sounds like a great way to use those grains. Feel better, friend. Please can you tell me where on earth you can buy wheatberries? I can’t find it anywhere – or is there a site I can buy them from? Ravenna – Where are you based? My local health food store has wheatberries AKA wheat grains. I’ve had a look online and can’t see any obvious suppliers. Very odd as my very small local health food store had them.